I love when food has fun names. Introducing Funky Monkey! Definitely a kid name huh? We have just recently gotten into the dried fruit scene. Don’t know why I didn’t buy them sooner because they are such EASY and healthy snacks! Especially for on the go. 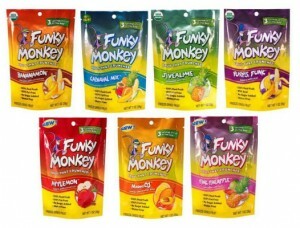 The other day I was at Whole Foods where I was first introduced to Funky Monkey. I was attracted to not only their name, but their fun colors and individual sized packages. Perfect for the diaper bag! 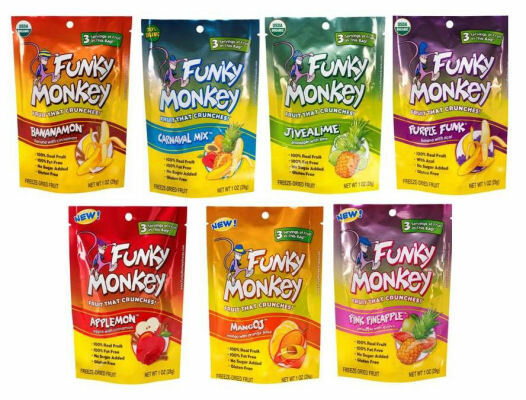 Funky Monkey Snacks are gluten-free, wheat-free, dairy-free, nut free, and contain no added sugars, colors, flavors or preservatives. They are vegan, raw and certified Kosher. A few are organic too! Their freeze-dry method uses a cashew shell powered boiler to use less energy. You heard me right! All leftover fruit parts like the peels and cores are used as fertilizer or animal feed. No waste! They have lots of yummy flavors to choose from! Our favorite is Carnival Mix which contains freeze-dried organic bananas, pineapple, apple & papaya. The small 42oz bag is one serving of fruit that we gobbled down in no time flat. It was nice and crunchy, tasted sweet and yummy, and we wanted more! O’Bear wanted me to tell you that his favorite was actually the JiveALime ~ pineapple with lime. He is my lemon-lime boy and he gives it the thumbs up! Be sure to check out Funky Monkey‘s website. It is very fun! You can order directly online, buy off Amazon or find it in a store near you. Oh, let me share their Facebook page too where you will find deals! Does your family eat dried fruit? What flavor sounds the best to you? I received some samples for review and all opinions are my own. Did you know there was going to be a Toy Story cartoon show exclusively in theaters at the Cars 2 showing? 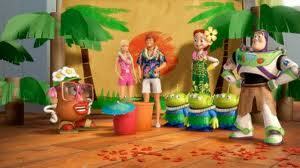 Set in new owner Bonnie’s bedroom, “Toy Story Toons: Hawaiian Vacation” features Woody (voice of Tom Hanks) and Buzz (voice of Tim Allen) and the rest of the favorite “Toy Story 3” toys as they create the ultimate Hawaiian vacation for Ken (voice of Michael Keaton) and Barbie (voice of Jodi Benson). It seems Ken badly miscalculated their travel arrangements, so the gang has to create a dream getaway in Bonnie’s Midwestern bedroom—in the middle of winter. Coming soon a Fandango.com Giveaway for tickets to see Cars 2!